Emergency services 24 hours a day 7 days a week in Brainerd. Essentia Health-St. Joseph's Medical Center is a 162-bed nonprofit community hospital located in Brainerd, MN. More than 1,400 employees and more than 120 physicians representing 21 specialties make St. Joseph's the largest hospital in north-central Minnesota. As a Benedictine-sponsored Catholic organization, St. Joseph's adheres to the values of hospitality, stewardship, respect, justice, teamwork and quality. 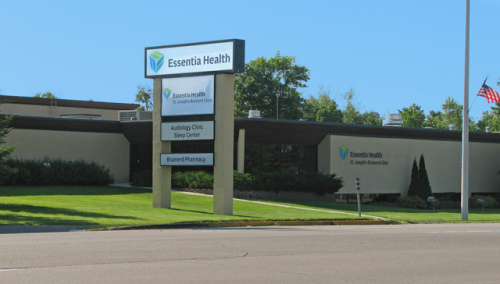 Essentia Health has medical clinics located in Brainerd, Baxter, Crosslake, Emily, Hackensack, Pequot Lakes, Pierz, Pillager and Pine River. We also have ConvenientCare located in Cub Foods in Baxter. St. Joesph's has been accredited by the Joint Commission since 1995. The Joint Commission's ''GOLD SEAL OF APPROVAL'' is an internationally recognized symbol of quality. This indicates that Essentia Health has proven its commitment to high quality patient care and its willingness to be measured against the highest and most rigorous standards of performance. MISSION: Throughout Essentia Health we are called to make a healthy difference in people's lives. As a member of the Essentia Health family, St. Joseph's Medical Center's mission as a Catholic, Benedictine sponsored facility is to promote Christ's ministry of holistic healing for all human life with special concern for the poor and powerless. Specialties include (but not limited to): Anesthesiolgy, Birthing, Cancer, Chemical Dependency, Critical Care, Intensive Care, Emergency Medicine, Geriatrics, Heart, Mental Health, Orthopedics, Pulmonary Medicine, Radiology, Rehabilitation, Surgery, Urology.